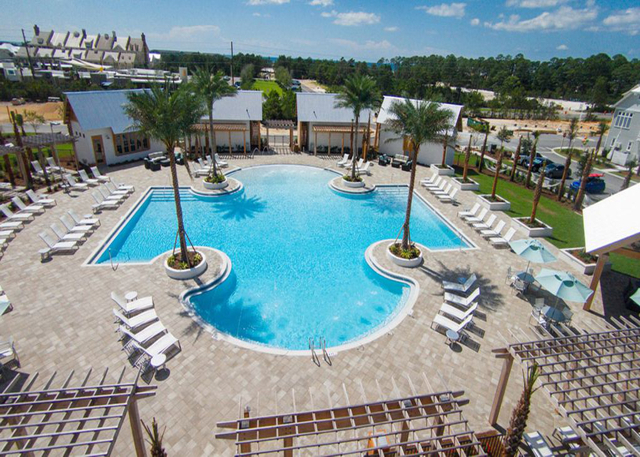 Prominence is an essential part of the 30A community, placing a desirable destination for leisure living and entertainment. It offers a number of amenities that are certain to make this vacation one of fun, fitness and relaxation, including a 5,000 sq. ft. pool with cabanas surrounding the poolside and a fitness center. The Prominence North Pool House features a resort-style pool, private cabanas, an outdoor dining pavilion, and a fitness center. The Hub offers something for folks of all ages and tastes, from tacos and tequila, to wings, burgers and shakes, a stop here is quick, tasty and convenient, and comes with a side of entertainment at the outdoor amphitheater. The Hub no only features restaurants, but also has boutique shops, and a covered event pavilion. Residents and guests enjoy events including concerts, family activities, and movie nights. These stunning condo are the perfect getaway any time of the year to enjoy a peaceful and relaxing haven, or you can take a look at our other 30-A units. Located along a 26-mile stretch of Northwest Florida’s famed Emerald Coast, Santa Rosa Beach is just one of the 16 distinct beach neighborhoods in south Walton County, each with its own traditions, charm and visual style. The community of Santa Rosa Beach offers luxury beach houses, upscale dining, and the unique artist colony known as Gulf Place. Santa Rosa Beach provides several entrances to Point Washington State Forest, a 15,000-acre preserve with more than 10 natural communities. In fact, all of South Walton is renowned for natural scenic beauty, turquoise waters and sugar sand beaches, including one of Travel + Leisure magazine’s “Best Beaches on Earth” for families.